I bent down to pick up my 2 year old grandson and felt as though something snapped in my lower back. This is the third time this lumbar spinal stenosis has happened, first time it took 3 months to get better, second 4 months; hope this doesn't take 5 months! It has taken me 20 minutes just to sit in a chair. I am waiting for appointment to see the doctor at hospital. I am taking naproxen and Co-codamol. The first symptoms of liver disease I experienced was itching. Bile was backing up in my blood. I have autoimmune disease and cirrhosis. I was diagnosed with small cell lung cancer in February 2011. It had metastasized to the left femur and tail bone. I went to an urgent care center because I knew I had bronchitis. Treatment did not ease the bronchitis so I returned to UCC. They took a CT scan to look for pneumonia, changed the antibiotics and sent me home. Two weeks later symptoms were worse so I returned. That's when they told me I had cancer and needed to see an oncologist. Thanksgiving and Christmas of 2010 were spent really sick and thinking that was going to be my last. I saw my oncologist end of January 2011 and started chemotherapy the 5th of February. I had to be put on oxygen and was at the point I did not care if I lived or died. I started a trial chemotherapy drug and at the end of the week I was off oxygen and felt so much better. I had 8 rounds of chemotherapy and I am glad to be alive now. The prognosis for small cell lung cancer is not good. I was given 2 weeks without treatment and 3 to 6 months with treatment. I am still here 3 years later and very thankful. I get CT scans every 3 months. Hopefully I will be around to see my 16 year old daughter graduate from college. I was born in 1951 and had just turned 54. In 2005 I was diagnosed with stage 11b non small cell carcinoma. I had surgery to remove my upper lobe. Then I had chemotherapy. I had allergic reaction to my first chemotherapy treatment which was Taxotere. I got over that and the doctor tried another drug. I was fine but I was very sick and lost 30 pounds though I kept my hair. My doctor decided I should have no more chemotherapy as it was causing more problems like fevers and dehydration. Well, now it is 2013 so it's going on 8 years. For stress fracture all the clinic did was to put me in a huge boot as if I had a broken foot, with no pain medicines or icing instructions or cause. Final instruction was to come back in two weeks (and spend a fortune) for an MRI. When I was sent to the medical center the doctor only asked me if I lost consciousness. I told him no, and he dismissed the problem of a concussion. I now have a dizziness and have a problem keeping my balance. My pulmonologist saw a tiny spot on my right lower lobe 3 years ago when I had a CAT scan for an unrelated illness. He said it did not look suspicious but, at the same time, it should not be there. He prescribed CAT scans every 6 months for 3 years. On my final CAT scan in April 2013, the spot had grown and changed shape. He immediately sent me to the surgeon to have it removed (using robotic technology). I had a wedge resection in July 2013. It was Stage I adenocarcinoma with clean margins and no spread to my lymph nodes. The oncologist said I do not need additional treatment, but I will need follow up scans every 6 months for at least 5 years. Early detection saved my life. I am a forty seven year old nurse, I had bronchitis in January 2015, which I have had in past, and was seen by a nurse practitioner. One week later I was still not feeling well. I got antibiotic and was wheezing. Two weeks later I was still feeling weak and new symptom was joint point all over. I decided to go see my family doctor who did a thorough exam and started me on steroid for five days. I got a lot of pain relief, although when it was done I had severe pain in chest and back for which I now went to the emergency room. They did chest x-ray and gave me nebulizer treatment and I was told I had pleurisy. I was sent home with pain medicines and inhaler. One week later I was back to emergency room with fever, pain in chest and back and weakness. Finally a CAT scan of my chest was done and I got the devastating news I have stage 3A lung cancer. I am doing radiation and chemotherapy as of a couple weeks now. I am sad, depressed and scared. I don't know now what my future will hold for me, but I'm very grateful for my loving and supportive family and friends. My final thought, chest x-rays don't show most lung cancers, CT scans need to be done sooner and apparently and more frequently because lung cancers are found in later stages, so sadly. I have always had medical problems, but in 1995, the stress I had to endure was too much and my body reacted. First, lupus, Leukemia for my Igg was 4610, fibromygia, neuropathy, and bone marrow biopsies. My Igg went down to the 2000's and low Igm and Iga. I began falling so my neurologist had me have a PET scan which showed I had non cell lung cancer dxed at the end of March. I have two of three lobes with cancer on my right lung. For the person that asked about the protein, yes, I always had high protein. I was tested for the chemo oral pill and because I have some mutant gene, it will not work for me. No radiation except to remove my entire right lung. I said no to that. I do smoke, but I am/was always into art. At 17, after high school, I went right into art school where there was no ventilation when we worked on oils, turps, linseed oils, pastels, etc. At 25, I also re-entered art school in another state also with no ventilation. At the end of March, I was dxed with non-cell lung cancer. There is no cure for me, and I told my children I will try chemo just for them. I start June 1. I will be having chemo for 2-1/2 hours for 3 weeks. I told my children if I get very sick, I am going to stop. I don't even cough. I just want to enjoy my life as it is now. I am 65 years old and live alone. I am also on a holistic orphan drug that is being tested. It seems I'm the only one that likes the test. I was diagnosed with stage one non-small cell lung cancer in January of 2011. I was operated on in April for a lobectomy of the upper right lobe. I had no follow up chemo therapy because my oncologist said they caught it early enough where they could more than likely get all of the cancer during the surgery as long as it hasn't spread to my lymph nodes. It has not. I will be going for follow up CAT scans and blood work every six months for a couple of years, and should be fine as long there is no reoccurrence. The cancer was already in stage 4 when diagnosed. It was in the lining of the left lung and the lymphnode above the lung. I was given chemo treatments for a period of three months, making me very ill. It could not be removed surgically due to being in the lining of the lung. A scan was done showing it wasn't spreading at this time. Three months later it had spread more. I am finishing 16 weeks treatment now with Avastin and different meds. They seem to be helping more. My husband aged 57 years was diagnosed with NSCLC (non-small cell lung carcinoma) on 22 December 2010. He had a wonderful treatment. He had no symptoms except a lingering cough. After having a chest x-ray he was told he had stage 4B lung cancer, unfortunately he passed away on 12 November 2011. I was just told that I have it three days ago. Its not the way to feel but now I feel like a walking talking dead man. My mother just got the results of her biopsy after several doctor visits. After all the tests, she has been told that she has lung cancer. She was also told that they had seen a spot a year ago but did not think it was anything to worry about. My mother's health has declined in the last year, and now they have found another spot that went from 3 cm to 7 cm in the last two months. The doctors tell us that the type of cancer she has is unusual; it's small cell cancer and large cell cancer. Every visit seems to get more confusing. Even though we ask questions, nobody seems to have answers. Now we are being told that she will need radiation and chemo but they don't think her lungs can take the treatments again. I'm confused. Reply to the father whom has been given 6 to 9 months to live - My father had liver cancer in 2011. We brought him over to France to have Cyberknife treatment. This is covered by your European Health Card - same as NHS, so free. The tumor shrunk in size and has been static since Jan 2012. This treatment is a much more powerful form of radiation which effectively kills off the cancer cells. If the lung cancer is 3 or less small tumors, this treatment should work. My Dad now has lung cancer, but opposition to my family prevent him having the Cyberknife treatment again, so apart from two courses or low dose chemo, he is now being left to die. Hope this message will help others. Speaking for my 27 year old sister. She was diagnosed 9 months ago with stage 4 lung cancer that has metastised to her brain. She has gone through a chemo treatment every three weeks. Chemo made her sick and very tired. The last couple of treatments were maintenance chemo. A Pet scan revealed yesterday that she has two more tumors in her brain, two more on her lung and now in her hip. There are soo many things she wants to do in life. The doctors are going to start different kinds of chemo. My Step-Father was sick last year and went to see his doctor who put him on antibiotics. After 2 lots of antibiotics he was still sick so he went in for a chest X-ray and they found something on his lung. After then having a bronchoscopy, it was confirmed he had a non small cell lung cancer. This was July 2011. He had his right lung removed in October and then went through chemo and radiation for 6 months. Then he had a CT scan done and the cancer had spread to the other lung. They started chemo again and one week later he was in hospital with pneumonia. Two days later he died. His body could not fight the infection as he had no immune system. He was a heavy smoker for a very long time but gave up nearly 6 years ago. It was too late for him. After diagnosis he lived 14 months. He was 58 years old. My mom had very painful osteoarthritis in her spine. When the pain increased in her upper back the doctor thought it was the arthritis. After a few tests it was found that she had lung cancer which had spread to the liver and spleen. She was given one dose of chemo and died the next day from the chemo. Chemo left her with almost no white blood cells and she rapidly developed pneumonia and died. My husband diagnosed with Stage IIIA (upper left lung tumor wrapped around pulmonary artery so inoperable)June 2011 (went in thinking had pneumonia as daughter had weeks before ... x-ray made them question about TB, then got CT scan, then lung biopsy), given 6 - 9 months probable life span with no intervention. He began chemo and radiation in July, ended 2 rounds of chemo in Sept and radiation a few weeks later. Tumor was shrinking. Now (6/12) found to be growing again. Time for Chemo round 2 ... still inoperable. Any suggestions? Should we look at a 2nd opinion? P.S. Positive attitude, love, and laughter helps a lot! My mother-87 had stage 3 lung cancer. Very healthy except for this. A smoker for 40 years, she had stopped smoking for 5 years prior to finding out she had cancer. She went through chemo and radiation at the same time. Diagnosed in June- died in Oct of the same year. I would not go through what she did seeing that the treatment killed faster than the actual disease. I had lung cancer in 1994, which would be 17 years ago. I had my lower right part of my lung removed, and I had no chemotherapy or radiation. I am 70 years old and in good health. I had a heart attack on Oct. 5. From an X-ray, it showed a mark on my right lung. A CT and PET scan showed it was cancerous. It was only about 2 centimeters in size, but that small thing turned out to be stage III. I had the lower lobe removed and just finished my first round of chemo. I start radiation next week. I'm trying to stay upbeat, but sometimes the fatigue just makes me depressed. The chemo didn't cause any issues with nausea or losing my hair. I am a non-smoker 57 year old female who has been very healthy. Three years ago I started coughing constantly and was told by my doctor that it was acid reflux. I was given medicine but the coughing continued. I was told to lose 10 pounds and it would get better. 14 months ago an X-ray revealed that I had a nodule on my lung. I was sent to a specialist who said it was nothing to worry about as I am not in the high risk category. The radiologist didn't want to take a needle biopsy as he said it would collapse my lung and it didn't look like cancer. Now 14 months later I have been diagnosed with lung cancer. I'm waiting for further tests to see if it has spread. The doctors who dismissed lung cancer because I have never smoked may have handed me a death sentence. I was diagnosed with stage 4 NSLC in July 2008 and put on a trial - had chemo (cysplatin and venorobin) daily for three weeks and 30 sessions of radiotherapy at same time - then two more weeks of chemo - it's January 2012 and I'm still here and feeling good - treatment was very hard going - didn't lose my hair! Still get tired sometimes, but also have rheumatoid arthritis which does not help - am going to be 60 this year and intend to party all the way. Cancer is a word not a sentence - think positive. I have stage 3 lung cancer I have been through radiation and chemo it is truly a battle but you have to have faith in God to see you through this. I have met some wonder people along the way which gives me more hope. I done 20 rounds of radiation treatment and 8 rounds of chemo with no problems but now I have had the mass removed they said I needed about 3 rounds of chemo I had my 1st round and it took me down my hair is falling out my body is so weak. I told the doctor I didn't want another round he said he would lower the dose by 10 percent. I hope the 10 percent makes a difference. My father is a stage 3 lung cancer patient. May 20, 2011 is the worst day in my life because his fnac test came back positive. He had peripheral and pericardial effusion. So the doctor refused to give him any chemotherapy or radiotherapy. Now he is taking tarceva 150mg every day. He is ok now. I don't know how many day will god help us to live with him. Please pray for him. My mum is 82 years old and has suspected NSCLC. Diagnosed last Oct 2010 when SOB was present and water in the pleural area. Now water is normal. But CEA has changed from 250 to 500. She does not have much symptoms apart from right should pain occasionally. CT showed a sizable tumor near the bronchial on the right and some showed in the lymph nodes. (2nd CT actually improved, some small dots are gone in the right lode). Not spread to other parts of the body yet. No treatment so far apart from some claimed Indian-made Irressa, as in China people this age no chemo- or radiation therapy. I am overseas and can only phone my sibling there. Will consider to start GB made Irressa soon - although costs a fortune. My siblings in China do not agree to use this as the cost is one reason; also it's not going to be a cure. It can only prolong life or lessen the suffering. Not sure is it the right decision to use GB made Irressa for treatment. 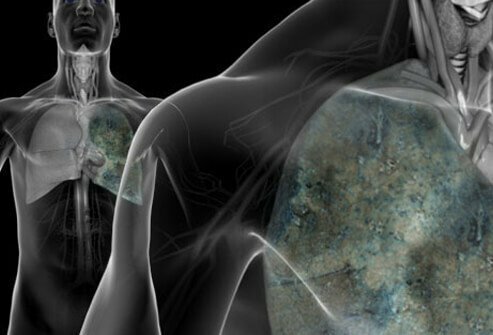 Lung cancer is really a dangerous disease. After I read this article, I suddenly get affected and remember my father who is smoking. I was just doing a research on my report about this disease and it really helps me. Thanks for this article I will tell my father to quit smoking now and this article was really a great help for my report. I was diagnosed September 2009 with non small cell lung cancer, had left lung resectioned November, started chemotherapy December 2009 continued through February 2010, had radiation on chest May and June 2010. Had seizures in September 2010. The cancer moved to my brain and I had 10 radiation treatments, I was told I am terminal but not actually given a time; I am doing pretty well. I smoked for 46years. I was originally diagnosed in June 2009 with rheumatoid arthritis, my doctor said I was too fit and active to be worried about cancer. I had a heart and body scan through my husband's work that they were offering in July 2008. I really didn't want to go but it was free. We went and I was diagnosed with Stage 1A lung cancer. I went through CAT and PET scans right away. The PET scan showed something by the rectal area. I then had a colonoscopy and an internal pelvic exam which all came back negative. I had my top right lobe removed and go for yearly CAT scans now. I still have a fear of not really knowing what the future will bring, but I am very happy to be living life now. In august I had kidney cancer they removed the right kidney, before the surgery they gave me a CAT scan, a small spot showed up on my lung they said it was probably the lungs folding over each other. For three weeks I have had pain in my chest to touch it is in the same spot and is painful to touch. I'm short of breath a lot. My dad was diagnosed last year with lung cancer. He was given 6 month to 2 years to live, but only survived 2 months. It was a horrible way to go. He was begging for air while being on a ventilator. What's your biggest challenge with living with lung cancer? What were the symptoms of your lung cancer? 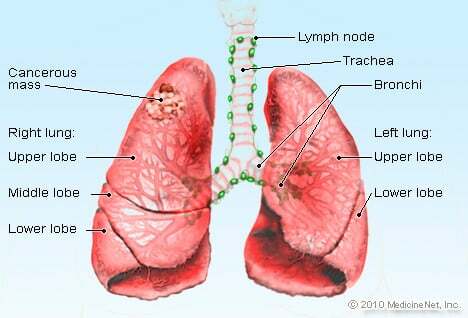 What stage was your lung cancer when you were diagnosed? What changes have you had to make to your routine since being diagnosed with lung cancer?